You can adjust the time in the clock display, using the CLOCK button. 2. Rotate to select CLOCK ADJUST in 3. Press . CLOCK ADJUST appears. 4. Rotate to select the item you want to adjust (12/24 hour mode, hour, minute). 5. Rotate to make the adjustment. 6. Press to enter your selection. The display returns to CLOCK ADJUST. Repeat steps 4 to 6 to adjust other items. 7. To enter the selection, Rotate and select SET, then press . 8. Press the MENU button to go back to the normal display. You can switch the clock display between 24 hours and 12 hours when in the menu mode. To set the time to the nearest hour: Press and hold the CLOCK button until the clock display begins to blink, then press the (3 (Reset) button. Depending on the displayed time, the clock sets forward or backward. 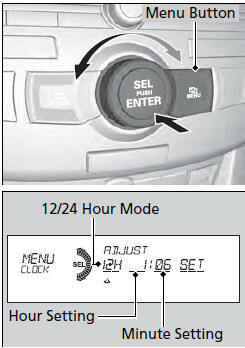 The clock is automatically updated through the navigation system, so the time does not need to be adjusted.